In February, I was in hospital for almost twenty days. Boredom had struck me early, frustration as well, due to the health issue but mostly due to my fellow human co-patients. My phone (previously), had also found this perfect time to present its first glitch and not connect to the Internet properly. Τhere was an available software update that would fix this Internet connectivity problem, but the lack of wi-fi connection at the hospital made that impossible. I managed to connect to the Internet using mobile data but it was only for short periods of time. 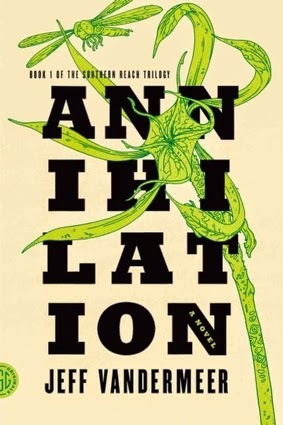 During one of those, I read an article about a book called ''Annihilation'' by Jeff VanderMeer, the first of the "Southern Beach" trilogy. The plot intrigued me so I downloaded it and began reading. It was as good as it was described, possibly even more. Four women, a biologist, an anthropologist, a surveyor and a psychologist are the members of an expedition to the uninhabited for years, Area X. The members of the previous expedition to that place returned changed and all of them died of cancer within weeks. The goal of this 12th expedition is for the women (the characters have no particular names, just their profession) to explore what is happening there and not get contaminated. They arrive and all hell breaks loose. I will spare you the details and the possible spoilers. If you liked the enigmas of the island in Lost and enjoy stories that are creepy but also beautiful at the same time, then this is a book for you. I'll just say this one: a dolphin with a human eye. Let that sink in.